I first came across the Business Model Canvas in the book "Business Model Generation" by Alexander Osterwalder and Yves Pigneur. It is a simple template for describing the various key elements that make up a business model - that is, how a firm extracts value from the markets in which it competes. Which key partners does the firm rely on, and for what? They could be normal supply, outsource or distribution relationships, but could also include strategic alliances between non-competitors or competitors, and joint ventures. Relationships may be exclusive and tightly contracted or more open market. It is also important to be clear what the firm gains from the partnership that it could not get alone, and therefore how partners are selected and managed. What key activities must the company perform in order to deliver its value propositions through its channels to its customers? These could include all the activities in the value chain, from product development to manufacturing to sales and marketing and post-sales support, as well as supporting processes such as hiring and developing staff, knowledge management and problem solving, and developing systems. See also How to use Porter's Value Chain Analysis. What key resources does the organisation need to deliver its value propositions? Key resources can include people and skills, physical assets, intellectual property, patents and copyrights, as well as data, brands and financial resources. What value does the company offer its customers? Value propositions describe which of the customers' problems are solved using the bundle of products and services a company offers, or which of the customers' needs are satisfied. A competitive value proposition is typically something which is new in the market, or which performs better, is more flexible/customisable, is better designed or is cheaper than what is already available in the market. What kinds of relationships will the company have with its customers? Customer relationships can offer high levels of personal service, or expect customers to self-serve. Business can be transactional where the customer relationship is limited to the purchase process, or relational, where the customer enters into a longer term relationship with the business. Customer relationships can span the pre-sales, sales and post-sales activities, like servicing, cross-sales and up-selling. Through which channels will the company deliver its products or services to its customer? This should cover the entire customer process including initial awareness, pre-sales, sales and post-sales experiences. This should include channel mix, multi- and mono-channel strategies as well as channel access and ownership. What customer segments will the business serve, and equally importantly, which segments will it not actively pursue? Customer segments are distinct customer categories which can be described in terms of what they need from the product or service and how they will use it, how many of them there are, where they can be found and through which channels they can be reached, what kinds of relationships you will have with them, what price they are willing to pay, and, taking all of the above into account, how profitable they are likely to be. See also What is segmentation and how does it work? What is the cost structure of the business? Costs may be fixed or variable, one-off or recurring, sunk or capitalised, deferred (as liabilities) or contingent (as reserves). Businesses with higher variable costs (relative to fixed costs) typically require less upfront investment and scale more easily, whilst businesses with higher fixed costs typically benefit more from scale. A low-cost business model will require a different cost structure to a high value-add business model. How much are customers really willing to pay? Revenues can be in the form of a one-off purchase price, or recurring subscriptions, usage or rental income. Pricing can be fixed, variable, or differential. Discounting can be used to encourage specific buyer behaviours. 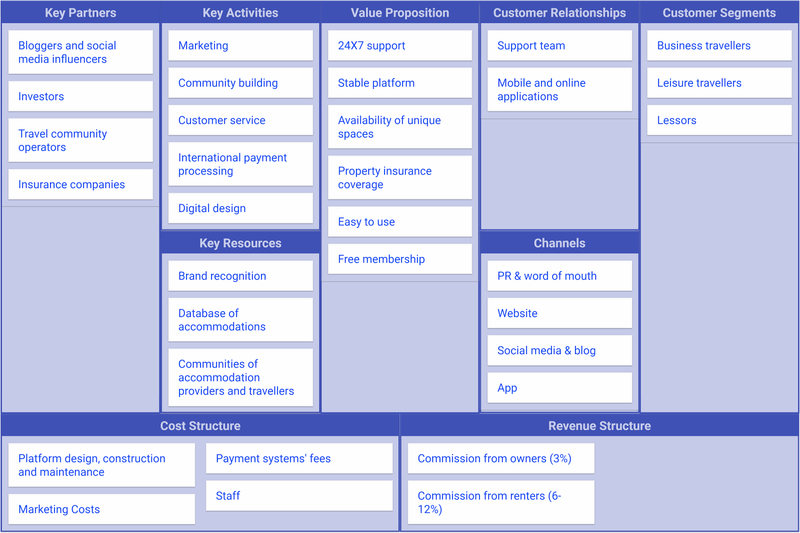 Business models can be work-shopped by outlining the above template on a large whiteboard, or using brown paper, and then writing short descriptions of each of the business model elements on post-it notes pasted in the appropriate blocks. The business model canvas can be used to describe and validate an existing business model or to design one or more future business models or business model changes. There are two things that are important in the design of a business model. Firstly, it must obviously be both viable and profitable. But secondly, it must be internally consistent. That is, the cost structure must be consistent with the economics of the key partnership arrangements, the cost of performing the key activities, and the acquisition and retention or maintenance of the key resources. These, in turn, must be capable of delivering the value proposition through the customer channels and relationships to the selected customer segments to the extent that they are willing to pay the price built into the revenue structure. In my opinion, it is the assessment of this internal consistency where the Business Model Canvas adds the most value.